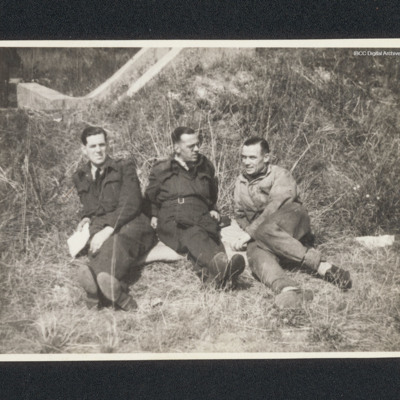 Three airmen, two wearing battledress and the other in overalls sitting reclining on grass. In the background the entrance to an earth covered blast shelter. On the reverse 'AVC, Waddington, 1945, L o o o R, Alec Applewhite'. Andreas N's account of the events at the City Cleaning Department, Franzgraben 85. Wilhelm Carl's account of the events at Wildemannsgasse 32. Otto Kappel's account of the events at Wildemannsgasse 24, Fisch-gasse. Gottlieb Sunkel and August Lehnebach's account of the events at the Civic Centre.